A laboratory at Purdue University provided a critical part of the world's first transistor in 1947 – the purified germanium semiconductor – and now researchers here are on the forefront of a new germanium milestone. The team has created the first modern germanium circuit – a complementary metal–oxide–semiconductor (CMOS) device – using germanium as the semiconductor instead of silicon. In new findings, Purdue researchers show how to use germanium to produce two types of transistors needed for CMOS electronic devices. The material had previously been limited to "P-type" transistors. 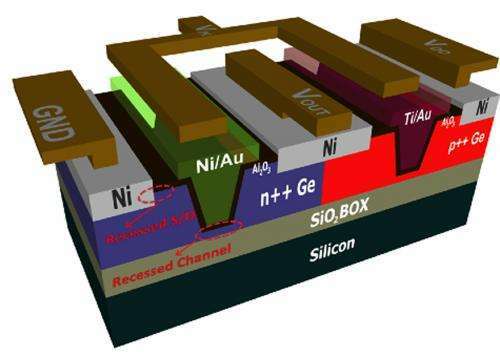 The findings show how to use the material also to make "N-type" transistors. Because both types of transistors are needed for CMOS circuits, the findings point to possible applications for germanium in computers and electronics, he said. The thin band gap of Geranium and its resulting high leakage and high power dissipation and temperature sensitivity are the reasons it was dropped in favour of silicon. If they can use a thin FET channel (where mobility speed is important) and improve the charge depletion (to reduce leakage) they might get a usable high density integrated circuit. Wrong again. The transistor was invented in the 1920's by Lilienfeld. Look it up ( http://en.wikiped...ienfeld. ) He developed the field effect transistor using germanium. He was not terribly successful because the technology for purifying, but he got the patent. He also invented the electrolytic capacitor, which, while not as earthshaking as the transistor, is a major component development.